People of Thailand annually celebrate National Youth Day on September 20. This national holiday commemorates the birthdays of two Kings of Thailand – Chulalongkorn and Ananda Mahidol. Chulalongkorn, or Rama V, was born on September 20, 1853. 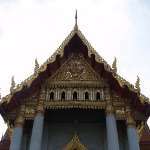 He was the fifth King of Siam and considered to be one of the greatest monarchs of the kingdom. During the reign Rama V implemented numerous social and governmental reforms. Western expansion threatened Siam and by territorial cessions to the United Kingdom and French Indochina he managed to save the kingdom from colonization. His reforms earned him the epithet the Great Beloved King. Ananda Mahidol was the grandson of Chulalongkorn and the eights monarch of Thailand. He was born on September 20, 1925, He became the king of Thailand in 1935, at the age of nine, when he was in Switzerland. He returned to Thailand in 1945 to assume the power, but six month later he was found shot dead in his bed. Celebration of National Youth Day intends to encourage young people through the country to realize the significance of their responsibilities toward national development for the sake of stability and prosperity of Thailand.